Installation view of As Essential as Dreams at the Menil Collection. Photography by Paul Hester. As Essential as Dreams: Self-Taught Art from the Collection of Stephanie and John Smither, Menil Collection, Houston, TX, On view through October 16, 2016—As Essential as Dreams showcases works from a monumental promised gift of Outsider Art to the Menil Collection. 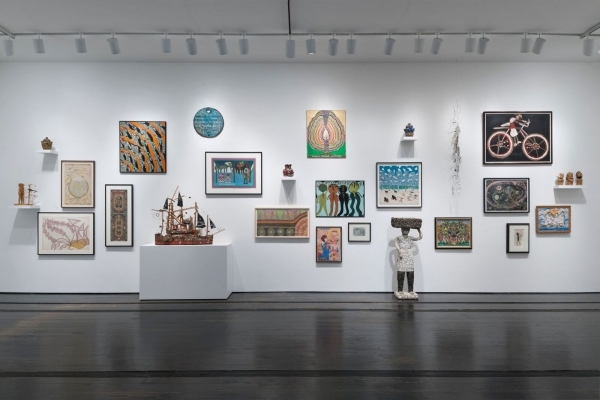 The bequest, which includes fifty works by such luminaries as Thornton Dial, Sister Gertrude Morgan, Solange Knopf, and Martín Ramírez, comes from the late, Houston-based arts patron and collector, Stephanie Smither, and her husband, John, who died in 2002.